197 John’s Pass Boardwalk W.
Over the past couple years I have had the opportunity to visit some amazing places and write about those that really peaked my interest and worthy of recommending to visit. From Peterborough Ontario to Port aux Basque Newfoundland and Labrador and now, south of the border and what better place to write about than Hooters, John’s Pass, Madeira Beach, Florida. While on family vacation in Florida I wanted to take some time to visit some interesting restaurants and just by luck, Hooters was one of them. I did visit Hooters in Edmonton Alberta before and was satisfied with the food and service, but when the opportunity presented itself for my brother-in-law and I to take our sons, well we had to take it (grandfather Noel came along too). It was a sweltering day in July when we decided to take a trip to John’s Pass. After walking the boardwalk and checking out some of the interesting shops, it was time for food. We checked out what was available and of course decided on Hooters. The boys’ reaction was curious but reserved as we approached the restaurant. The room was nice and cool and we were greeted by a friendly server who guided us to our table. Plenty of pictures of famous people posing with Hooter Girls were mounted on the walls and carefully placed TV’s had the games of the day on for our entertainment as we waited to order. I came for the wings but also wanted to sample something different, so I also tried the Fish Tacos. 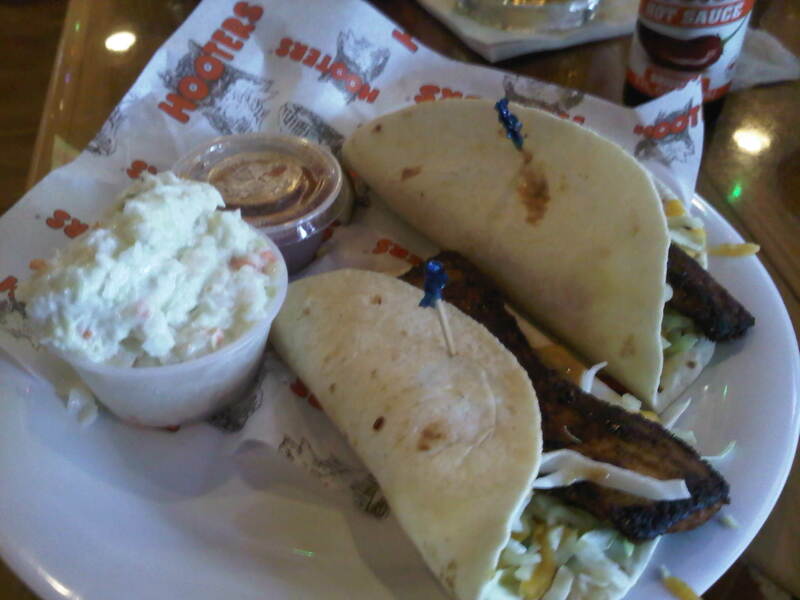 The grilled mahi was very well seasoned (reminiscent of a blackening seasoning) and was balanced with the tortilla, shredded cabbage, cheddar cheese and a “secret” sauce. The slaw was also refreshing in between bites. 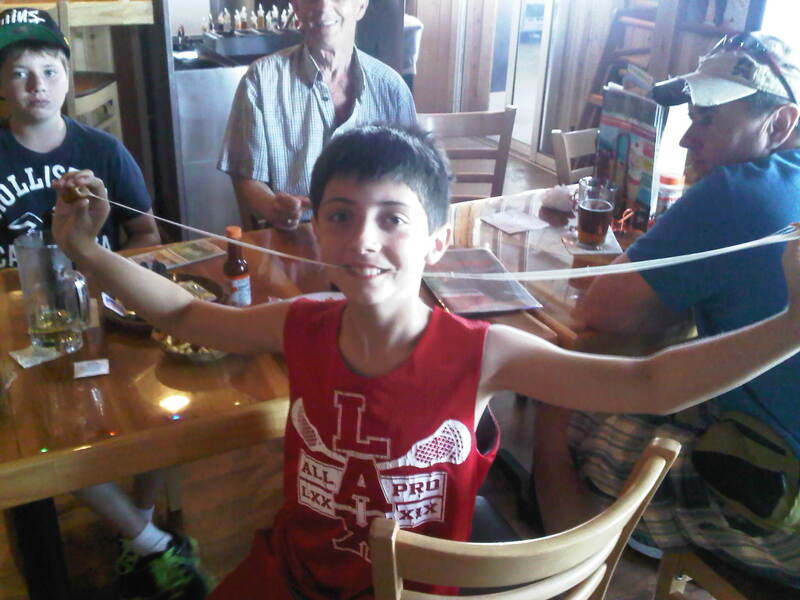 My son Kaegan was all over the “Cheese Sticks”, served with a marinara sauce that I enjoyed with my taco. 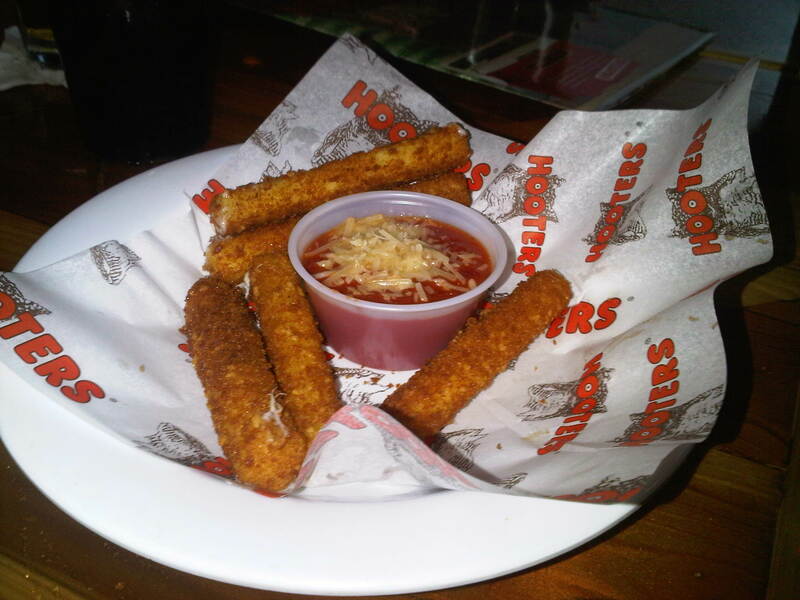 The breaded mozzarella sticks did not disappoint as they were tasty and entertaining. 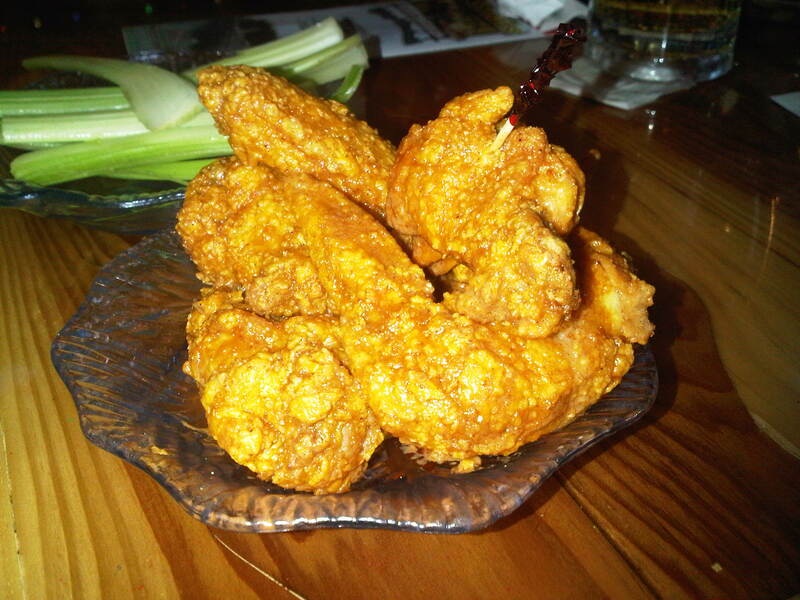 Some of the best wings I have ever tasted. Honestly! It was time for my wings to arrive and I was impressed by the portion and the plating, a heap of crispy wings that still, in November, make my mouth water just thinking about them. I ordered them hot, but not mind blowing and they had a deep rich flavor and smelled as good as they tasted. Very juicy and cooked, in my opinion, to perfection (wing tips included was a bonus). 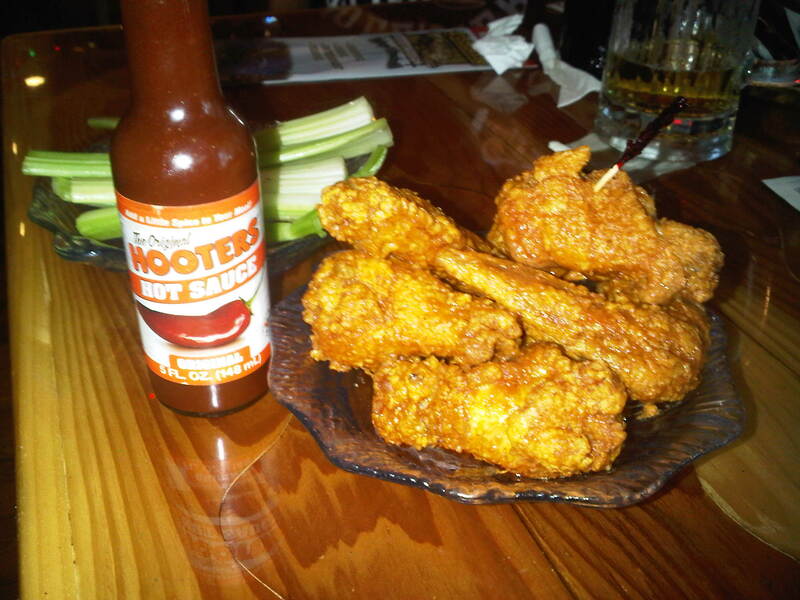 For those who do like a kick on their wing, try their hot sauce. It was a wicked addition to the last couple wings I had ( I purchased a bottle to take home with me too!). Now back to the boys!! We could not leave our Hooters experience without our sons getting their picture taken with the girls. Now, Kaegan and Caleb were not the most excited at first. I think they were a little shy; but with the help of their dads and sporting their newly purchased Hooters T-Shirts they now have a photo to show off for years to come. Thanks to the Hooter Girls!! By the way, Cosmo our dog loved his gift. Looks good on him! 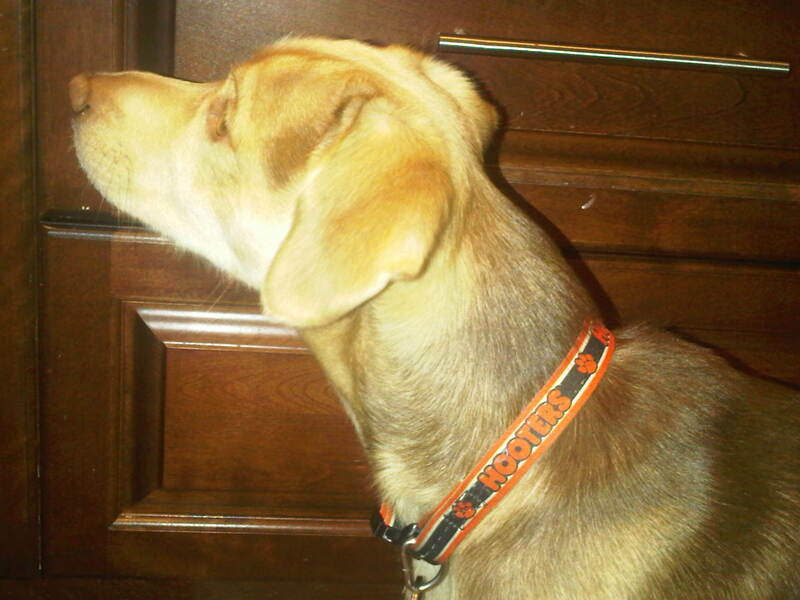 Cosmo showing off his new Hooters collar! !